Sigh. When can we finally use the internet for what it was intended for? Clearly, we’re talking about watching hours and hours of cat videos. Instead, the darling people of the internet have once again decided to shame a celebrity. We know all about fat shaming and even the mommy shaming that celebs like Chrissy Teigen and Kim Kardashian have faced. But there’s a new type of “shaming” on the block: lip shaming. And the target is Jessica Simpson. If lip shaming sounds ridiculous to you, that’s because it is. It all started when Jessica Simpson posted a selfie on Instagram rocking a cute pair of sparkly sunglasses and puckered up lips for the camera. The star captioned the pic with “Walkin’ #12000Steps #SandpaperSmooch #ShowMeYourSteps.” She’s clearly into fitness and trying to get her daily steps in, but the internet immediately focused on her lips. Simpson’s use of #SandpaperSmooch seems like she’s playfully joking about her lips being a bit dry. We’ve all had dry lips! Is that really a big deal? Well, according to the comments that flooded her Instagram page, dry lips are the worst thing ever to happen to a human being and you must seek help!!! Immediately. 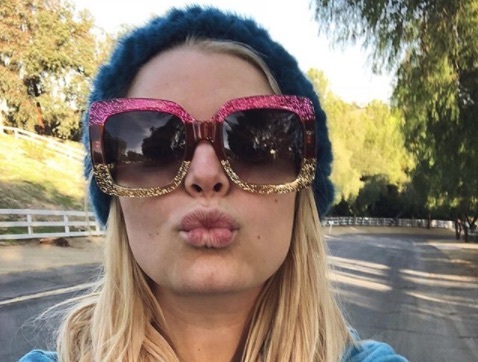 We love your selfie, Jessica Simpson! Seriously, she’s posting a photo related to fitness and even encouraging her fans to get healthy, but this is what people are focusing on?! Comments ranged from “Moisturize those lips girl” to calling her lips “crusty” and even going as far as to recommend she see a doctor. Others took it a step further by assuming Jessica has had lip fillers or injections that permanently damaged her. Though in 2006 she admitted to getting Restylane in her lips and regretting it, since then she hasn’t discussed any facial procedures. Regardless of whether she has had work done since then (and if so, that’s her business! ), people felt the need to assume something is physically wrong with her. Be better! Don’t worry — Jessica Simpson posted a follow-up selfie, and her lips look perfectly moisturized. And after she did, people switched from her lips to her celebrity doppelganger: Ricky Martin. Imagine a world where a celebrity could post a selfie without getting dragged for one reason or another. Come on, people of the internet. You’re doing the most.